Two months back, I did a write up on Buzzlogix (you can find the article here). And just like what I had said previously, what attracted me about Buzzlogix is the Smart Assistant. The Buzzlogix Smart Assistant offers a unique set of features that assist the social media specialists to simplify their social media campaigns, measure results, extract valuable insights, automate tasks and make valuable suggestions throughout the process. And the list goes on very deeply such as sentiment analysis, wizard-based configuration, hashtag suggestions and template based streams to name a few. 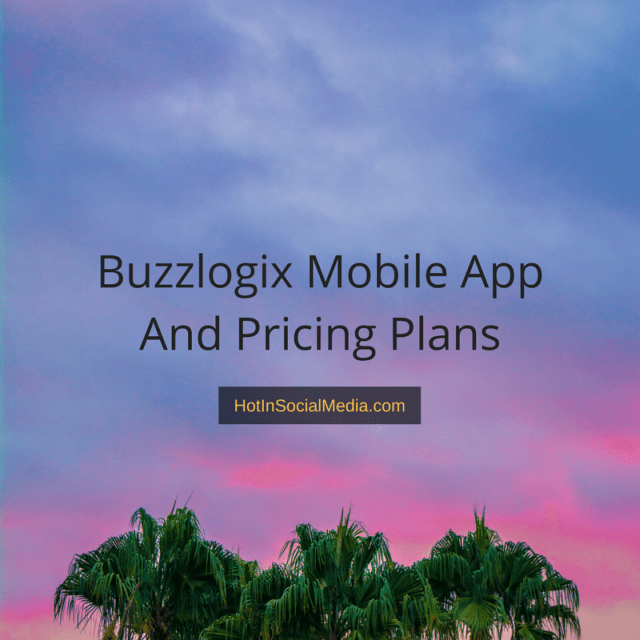 This article is going to be divided into two different parts: the first part about Buzzlogix mobile application and another would be the new price plans (or pricing structure). Before I start, I want to stress that it is critical for any company to have mobile applications available for the users especially when they are in the social media industry. Social media industry never sleeps and thus, we often want to be kept briefed on the current situation (regardless for business or leisure). It makes all the sense for Buzzlogix to have a smartphone application for the users. With its competitors doing the same, it is definitely a no brainer! Now, what does Buzzlogix mobile app does? A lot, to say the very least. 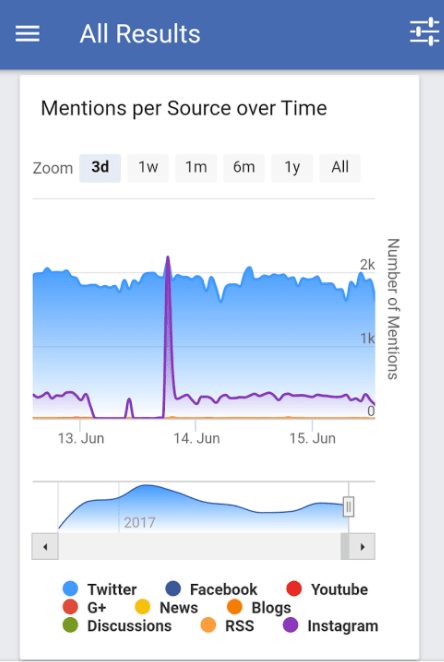 Using Buzzlogix mobile app, you can easily get hold of the most important metrics about your brand’s mention based on topic streams or combined. For me, I rather go for specific streams as it is easier for me to segment the different topics and targets I’m focusing on. Monitoring the different topic streams is always a very challenging task. To be honest with you, I hate it because it can be really messy! Moreover, navigating on your mobile screen makes it even harder! This is why it is very timely for Buzzlogix to allow you to monitor different topic streams with just a few clicks. Smart move! Want to be kept updated with all the updates? Well, that’s what BuzzAlerts is all about. Now, you can easily access it via your smart devices. This means that you can be kept updated with all the notifications in the social media world and you can even customize your own settings to fit your needs. Just like the desktop version, Buzzlogic app allows you to manage various social media platforms (Facebook, Twitter, Instagram, Google+ and WordPress) under one roof. Of course, it is a no-brainer that this saves times that we truly love! As a social media marketer myself, I find this very useful. I love this as a matter of fact because it allows me to manage all my inboxes in one place. I no longer need to swap different apps just to reply to others on social media because I can now do it at the same place. Plus, it is also a great way to save battery as I can only turn on the notification for Buzzlogix and turn off the rest! The 6th reason for using Buzzlogix app is because you can now publish posts to multiple networks. What’s more important is that you can do it directly from your mobile phone. In my previous Buzzlogix review, there wasn’t any mobile app and the new update is great! Instead of publishing post by post (copy and paste), you can now publish once to all social media accounts of your choice. Not bad to be honest. 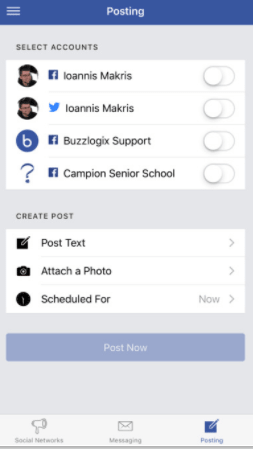 Common but important, you can now schedule posts on the go using Buzzlogix app! I find that ideas come at all times, especially in various places (and during my traveling). Being able to schedule posts on the go is crazily important and it saves me a lot of time as well. I was very curious about how they are going to price their product and finally, they spilled the beans. Let’s dive into the matter and see how they fair, shall we? Buzzlogix plans and pricing is divided into five parts. For starters, most companies don’t offer that many but hey, it certainly looks good because it gives users like us with more choices. I am surprised that they gave out a free plan, to be honest. Remember the ‘Smart Assistant’? I think that worth more than anything else! Anyway, the free plan costs you zero money for the rest of your life. Along with it, it comes with a nice 3,000 mentions, ability to manage up to five social media profiles, one analytics report and unlimited users. Now, let me rephrase, “Unlimited users” is crazy because no one in the market (that I can think of) does that. It’s crazy, it’s bold and more important it is good enough to attract me! For a social media marketer, 3,000 mentions may be a small number but it works very well if you are just starting your brand. For $19.95 per month, you will get 6,000 mentions, unlimited social media profiles, two analytics reports and yes, unlimited users. This is a good plan because of the higher quota for mentions and social media profiles. Plus, having two analytics report is a nice add on. This plan starts at $49.95 per month with 15,000 mentions and four analytics reports (along with the rest of the features that remain the same). This is pretty good if you are a freelance social media consultant or, managing your company’s social media platforms. Four analytics reports are sufficient for most reportings and 15,000 mentions is really a big number! As a small/mid-sized social media agency, this is a good option because it comes with 50,000 mentions, unlimited social media profiles, and up to eight analytics reports. For the price of $99.95 per month, this is one of the most affordable plans in the market. Let’s be honest. You know how much social media marketing costs in the real world — so, this is one great deal that provides firepower and flexibility. Last but not least, the mega-plan that comes with a whopping, 250,000 mentions and 16 analytics reports. Big time social media agencies or huge organization should consider this because it gives you powerful features and flexibility. The high quota allows you to monitor your audience and even your competitors while the analytics reports would give you a better understanding of the market (and how your brand fair in the market). I have seen Buzzlogix during its ‘younger’ days and trust me, it had grown a lot. The application is getting better by the day and the features are worth ‘dying for’ to say the very least. What do I think about Buzzlogix? It had just gone on par with many other social media tools in the market thanks to its features and of course, the mobile application. Should you try Buzzlogix today? No doubt in my mind!